I've had a big weekend in London for one of my oldest friends 40th birthday bash. We go back more than 20 years....over the course of the proceedings she reminded me that we met at a rave.....'you know, that one by the roundabout?'?! Erm....Amanda can you narrow that down a bit......roundabout?? This was a very long time ago and the details are a tad blurred for us all!! Anyhow, back then we enjoyed partying hard, we progressed to clubbing, endeavoring to be a little bit more sophisticated and then we headed off to spend a Summer out in Ibiza! She ended working out there....whereas I just went out for a month of fun! Many more Summers in Ibiza ensued for Amanda so with this kind of nightlife background I knew she would want to recreate the good old days!! She did all the leg work a few months back, she knew she needed to accommodate 80-100 guests so she went for a very secretive private dining experience where you would get a text an hour or so before with an address to you could get to within 30 minutes!! Can't say too much about the event as they ask you to be discreet but needless to say there was lots of fun to be had! For me the best part of the trip was catching up with everybody from those good old days! I travelled up from Bristol with another friend who harks back from way back then!! We arrived at lunch time, leaving us a couple of hours to hotfoot it around Oxford Street for a spot of shopping! First stop was Jo Malone for the birthday girl. We then had a quick flit around Topshop, H&M and Zara but I had set my sights on securing this little number from Uniqlo. 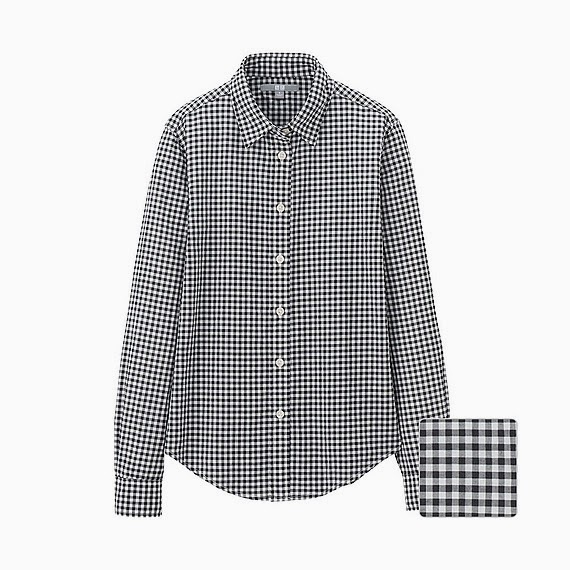 This fab little black and white check gingham shirt was £19.90 and I have to say for the price it is excellent quality. It's a very fine cotton, definitely Spring weight......so lovely I wore it home on Sunday and I have it on again today......maybe that's just a little bit too much information!! Anyway with our shopping done we headed off to meet up with more friends as were all staying at the Hoxton Hotel in Shoreditch. The Hoxton is fab for anyone wanting to stay that side (east) of London. It's a great place to hang out and chill and it was an excellent base for where we were going as the birthday girl lives nearby in Bethnal Green. We arrived and had a couple of cocktails with our host before heading off to our rooms to get ready. My one regret is that I didn't take more photos but I shall share with you what I got! We spent most of our time hanging around in the bar reception area......I would have happliy have stayed rooted here for the whole weekend as it was the perfect place for people watching! As you can see by the pram....they cater for everybody! The bedrooms were fab too! Love the humongous mirror! No good for selfies though! Some shots of party time! There was a space ship theme! Here's a flavour of how the food was served up! This is the best shot of my outfit I could come up with! Don't you just love the goggles!! Looking all very etheral too! I have recreated the look in daylight! Think I pitched this outfit perfectly! I did take the recently purchased Jaeger dress but as we ended up in a couple of proper east end pubs, I'm glad I went with the vintage top and trews! And finally today's outfit featuring 2 new purchases, the Uniqlo shirt and some Nike Free trainers.....oh and some colour!! Let me warn you.....the trainer obsession is in full force!! There we have it....a slightly different post from me! Would love to hear your thoughts about anything and everything!! You've learnt a little bit more about me.....lol, not sure if that is good or bad thing?! Look forward to seeing your comments and responding to them! A few more sale finds! I struck lucky again in Gap when I visited Clark's Village outlet in Street where I bagged another classic! I managed to score a lovely mac. Now I do already own a trench from Gap but it's of the belted variety and to be brutally honest I have always felt like a sack of spuds in it so it was relegated to the work wardrobe long ago. However the new mac is an a-line button though, just very simple! 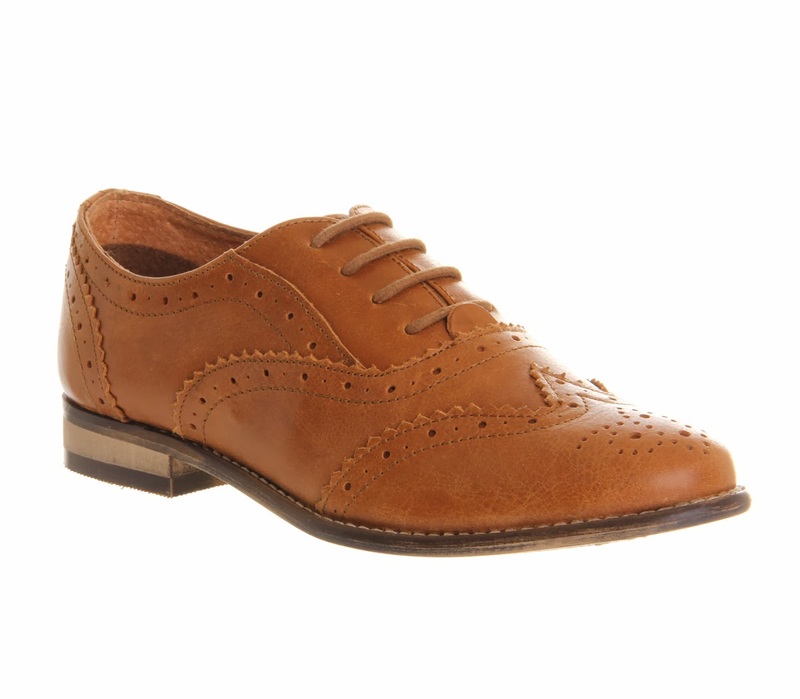 The second I put it on I thought about how great it would be with the new brogues! Sold! Another good deal too as it was £49.99 with 30% off taking it down to £34.99! Although I was trying to be strict with myself and only allow myself one purchase at the outlet centre, I did also manage snag this gem in the Whistles outlet. Loved this when I saw it on the WIT blog a few months back, unfortunately it was sold out :0( So happy to see it sat there waiting for me.......for just £20 too! After my success in the shops I did go back to the on-line bargains. Hands up as I have been stealing Susie So So's style yet again! 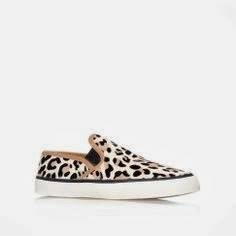 I got the Next cheetah print slip-on's a couple of weeks back and went back in for the black pony skin version as I knew they would be useful....at only £18 it would be rude not too!! There are still some sizes left in their clearance on-line. Onto my final and favourite purchase. I have a big 40th bash in London next weekend and have been fretting for weeks about what to wear. I happened to stumble across this great little Jaeger boutique dress on ASOS. The dress arrived on Friday and I was so taken with it that I wore it out for dinner on Saturday night. It's jersey with a black sequin spot on it. Perfectly understated for me....think it will be brilliant for the party next weekend it was a great price at £42. Another 5 sales purchases that I am really chuffed with. There are a couple more things on the hit list that I would like to procure, cue a lot more leg work but my spring wardrobe is already shaping up nicely! Which is your favourite of my bargains so far? Have you been buying sales purchases with Spring in mind? Have you bought anything new season yet? What's on your hit list? What have I been wearing these past few days? Here's a quick round-up of mostly school run outfits! I'm off to London at the weekend for the aforementioned party and I can't deny I've made sure there is a bit of time to shop in hope that I may uncover another sale gem or 2! Wish me luck and don't forget that I love hearing your thoughts and responding to your comments! So typical! The minute I had had my hair cut and coloured last time (which was in November) I saw a new cut/style that I just knew I had to have! Unbelievable ehh?? Anyway I've hung out until now! I wanted something shorter and fresher....cue a very savage trim this time! Only fair that I share the inspirational style first! I love long hair and I have for the most part of my adult life worn it long. I did have a bit of a wobbly just before my daughter was born in 2006 and had my long hair cut into a shorter bob thinking it would be less maintenance. However I quickly realised my mistake as at the time I did like my hair to look ever so perfect and would spend ages drying and straightening which was difficult to do with a baby! I couldn't wait for it to grow again so I could just stuff it into a pony tail on my bad hair day! Anyway it's been long and layered for about 5 years now. About a year ago I rid myself of the blow-drying after reading an article about how French women only use supermarket brand shampoo's, no conditioner and prefer not to have an overly done style. Gosh....the freedom of the wash & go! I get ready in half the time now! And my hair seems to be in better condition as the use of the straighteners has been limited to just perking up the ends now and again! Anyhow.......I felt my hair needed a bit of oomph! It's quite fine but there is a lot of it and I wanted to lose some of the bulk. So I went for it! Here are the before and after shots!! So this was the barnet yesterday....covered a few angles here so you can get a feel for the length of it. And here we have the new 'do' which I think you will agree looks younger and fresher....well it's feels that way! As you can see I've lost a fair bit of the length along with the bulk. It feels lighter and in much better condition. I am chuffed to pieces with the result and so on that note I would like to say a huge thank you to Sarah Slade......I know she reads this! You're a star Sarah. She is a fellow school run mum. She comes around to mine of an evening, brings her son and daughter who keep my little 'un entertained! We make a night of it as I put pizza's in for the kids and we may have a sneaky glass of wine on occasion! I can't recommend her highly enough as she is great with hair and a lovely person to boot! So there you go! It's time I start clearing the wardrobe out now that my appearance has had a freshen up.....the wardrobe needs a purge too.....oooh the motivation! First up is Saturdays outfit....when I came over all nautical with the stripes and pea coat! Aye-aye captain! No photo for Sunday as we had a full-on day at a tobogganing party and dance show rehearsals.....I did spends most of the day in slobs. Any thoughts on the new hairstyle? Are you planning on a change of image for Spring? Anyone else done their wardrobe clearout yet? Love reading your comments and responding to them! So! 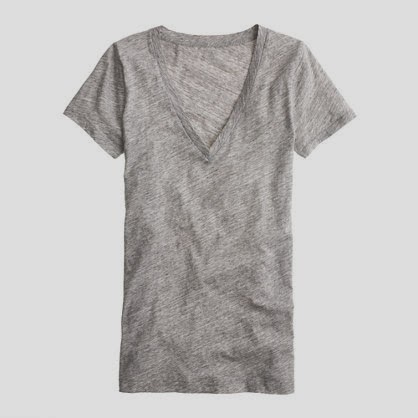 I have been in search of the style staple that is the grey T.
I ordered this one from J Crew. And so I waited. I had failed to grasp that it was actually being shipped all the way from the states! It came like this. Honest opinions please! The fit is quite good, I ordered a small which they say is equivalent to a UK size 8-10. It's long which is a plus point but I do think the V is a bit too deep....almost bordering on obscene on me although it's doesn't look too bad in the photo, it's low and I feel exposed! I don't have any cleveage to speak of, I'm not sure whether that's a good or bad thing! I'm laughing at myself as my pose is making me look like I have a spare tyre round the middle....I promise it's not so bad in the flesh! The colour is a bit lighter than I wanted, this one screams high Summer with white skinny's, for me it's not for right now. I'm not a 100% sold on it. What say you? 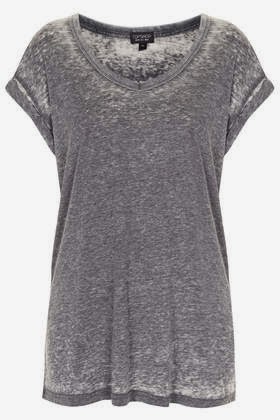 So typical that whilst waiting for the J Crew t-shirt to arrive I saw this grey T when whizzing through Topshop the other day.....like buses 2 come along at once! This ones priced at £16. It's quite roomy, you may want to size down. I tried on an 8 and there was plenty of fabric in it. 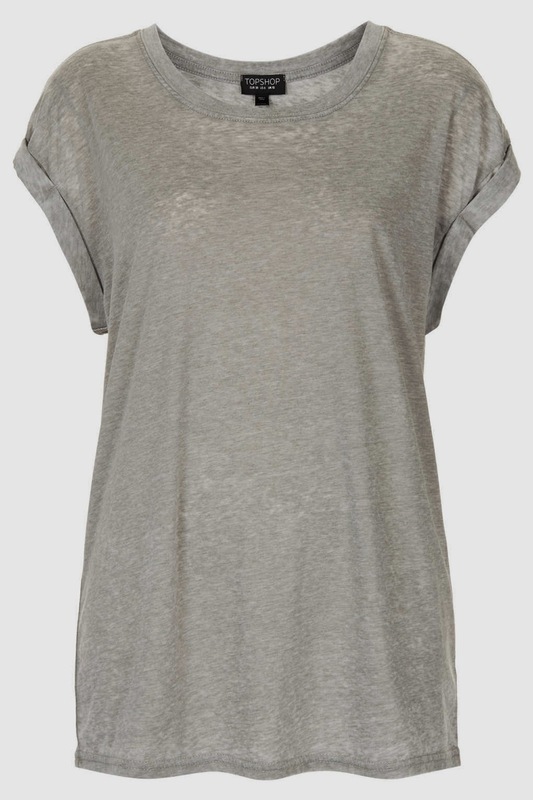 Love the slightly darker shade of grey, you could wear this one now so definitely a keeper! Here's it is on. 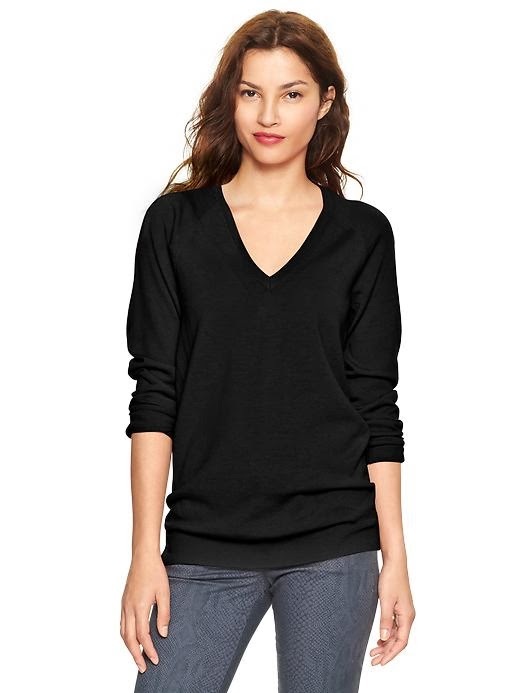 Love the slouchier shape and I think you'll agree the V is much more flattering. This next one is also from Topshop. It's very sheer and would need a vest underneath but the shape was good on this one too. So now I'm very tempted by this one. So what do you think ladies? Should I keep the J Crew one? I'm in a quandry, do I need 2? I looked for a good grey T last Spring/Summer with no success.....is that a sign I should keep both? Should I send back the J Crew and go for the lighter Topshop one? Decisions, decisions!! Has anyone else spotted a good one that I may have missed? Moving swiftly on to what I've been wearing of late! A keeping it simple Sunday look! Back on the school run form! Thank goodness I retrieved these old school Stan Smiths from the loft......just the job for keeping the feet dry in these horrendous weather conditions we've been having. Dressed for a spot of outlet shopping! Thank you for reading....I look forward to seeing your comments and responding to them! So I went forth into the sales with a plan based fairly loosely on what my most successful purchases of the Autumn/Winter and of course the obligatory bit of inspiration from Pinterest! As the New Balance trainers were the top of the list of my best buys and I had found the inspiration on Pinterest.....I went back to my boards to peruse. And came up with this lovely look, deciding I must get some of these leopard print slip-ons! Here's another look that sealed the deal! but the colour way is pretty Spring like and I'm not ready to go there yet......I am waiting in hope that I might be able to bag these with a discount sometime in the near future! Anyway I started to search for an alternative to wear now, so that I can give the New Balance a rest now and again....lol, do you like my justification?! ;0). So the sales are on and I managed to snag these in the Next clearance section for £18 (originally £38)! They don't appear to be on the site now so I've had to use my own snap! Yup! They will do just lovely for now! And so onto my next purchase.....more footwear! More inspiration from Pinterest! Now, I've wanted a pair of brogues for a while.....I love the above look and also have fancied the notion of wearing them with opaques and a ditsy print dress and a boyfriend cardy (my fascination for the preppy-look lives on!). I did have a black pair in mind but then realised that actually a tan pair would be far more useful and a bit more casual as that is the road I am going down after my little wardrobe review! I'll admit that I did buy and return 2 pairs before settling on these from Office called Poppet! These were a fab bargain at half price......just £30! Having worn both pairs of shoes already I know I've done good! Now the next item I didn't intentionally set out to buy but it sat on a rail right next to the cash desk whilst I was waiting to make a purchase and I couldn't leave it behind as it was just £4.99! 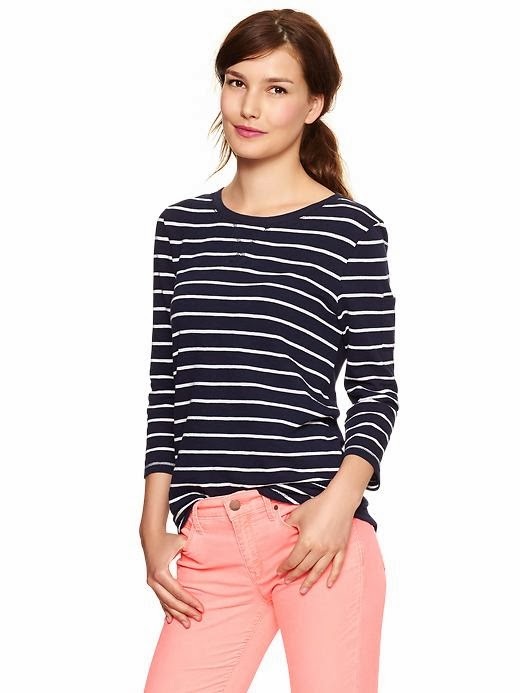 Who could turn down such a great Breton style top if you didn't have one in this colour way! Good old Gap! Sadly the item I went to purchase in Gap was not reduced in store, although it is online?! However I'm not feeling to sorry for myself at having to pay full price for it as it's such a staple. I had a loose fit H&M grey sweater that was on it's last legs and I was ready to part company with. I needed a replacement and as I had so much wear out of a sweater that cost me £14.99 I happily paid £39.95 for this Merino crew neck jumper. Last but not least I have ordered a top after hankering after a good quality grey T for some time. 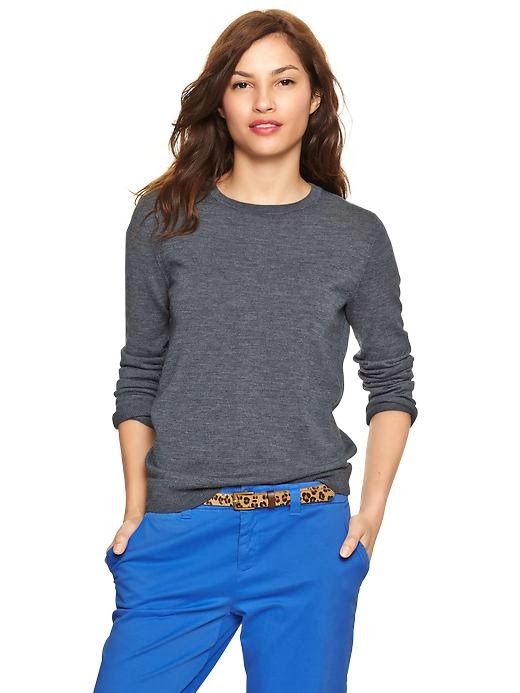 Luckily this one from J Crew has roughly a third off and was marked down to £20.50 (free P&P). It hasn't arrived yet and as I've never ordered or tried anything from J Crew before so it may not work out.....fingers crossed that it does though so that I can rustle up a look like this! I have to say I'm chuffed with my sales purchases so far, I've stuck to some basics and things I've been wanting for a while. All of the above works fantastically well with what's already in the wardrobe so all in all......I say the girl done good! The proof is in the pudding....so here are my looks from the past few days! Trying out the brogues with the shirt and sweater combo! Next outfit was for a few drinks post-Christmas pre-NYE party. Not featuring any of my new items at all! You can see these brogues are going to be just as useful as the New Balance trainers as here I am sporting them again today! I have done most of this sales shopping in the comfort of my own home only venturing out once the research had been done and I could safely hit one or two shops with a seven year old in tow! That's me done on the sales front for the moment, although there are so many tempting bargains out there I am happy with what I have for the time being.....not something you hear me say often! I love reading and responding to your comments....any thoughts on any of the above?